Who Took the News IQ Quiz and How Did They Do? On Feb. 5 the Pew Research Center released a report on its latest NewsIQ Quiz, “What the Public Knows – In Pictures, Maps, Graphs and Symbols,” based on interviews with 1,041 randomly sampled adults nationwide. Since Feb. 5, more than 350,000 people have taken the quiz on the PewResearch.org website. A large majority of them took the quiz after hearing about it on social media, in a blog or news story or from a friend or family member’s recommendation. Others may have found the quiz while visiting the Pew Research web site for other reasons. How do all of these quiz-takers on our website – who, unlike the national sample we interviewed, volunteered to take a quiz about their knowledge of public affairs — compare with the national sample of adults? The answer: very well. Those who took the quiz on our website were considerably more knowledgeable than those who responded to our national survey. Nearly one-third of quiz takers on our website (32%) aced the test – answering all 13 questions correctly – compared with just 8% of adults nationally. And nearly one-fourth (24%) missed only one question, compared with 11% among the general public. 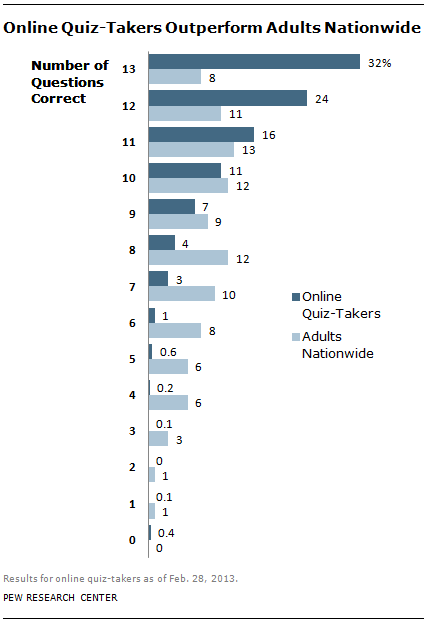 Overall, our website visitors correctly answered an average of 11.2 of the 13 questions, compared with an average of 8.5 correct among the national sample of adults. For the most part, the questions that were easiest for the general public were also the easiest for our volunteer quiz takers. Nationally, 87% correctly identified the Star of David, while 96% of quiz takers on our website did so. Nearly eight in ten (79%) in the general public recognized the Twitter logo, as did 94% of web quiz takers. The hardest question for the general public – identifying Elizabeth Warren from a set of four photos– was also the hardest for those who came to our site to take the quiz: 43% of the general public could identify the new Massachusetts senator, compared with 71% of our visitors. One big reason for the good performance of our visitors is that most of them are well educated, and college-educated people tend to do very well on the quiz. Nearly three-quarters of our website quiz takers (74%) are college graduates, while another 20% have completed at least some college. Among the 1,041 adults in the general public sample, only 29% had completed college and 29% had some college experience. And to state the obvious, another reason may simply be human nature: People who are knowledgeable about politics are more likely than others to volunteer to take knowledge tests. Scott Keeter is Director of Survey Research for the Pew Research Center.